2 bedrooms; one with queen bed and one with 2 twins. 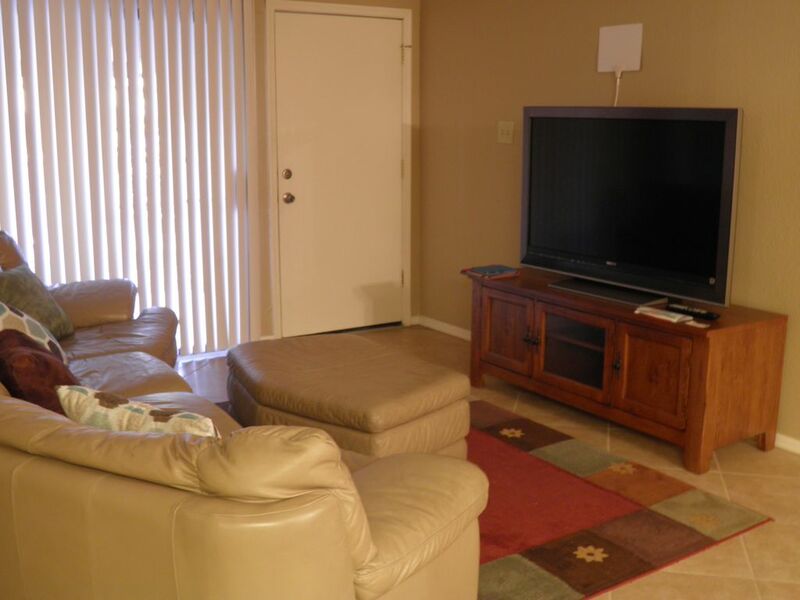 Fully equipped kitchen, large TV, WIFI, comfortable and beautifully decorated. Reserved parking spot. Medical facilities across street. Pool, workout room in clubhouse. Close by markets, restaurants and fast food . Bar-B-Q available. Easy drive to baseball, football and hockey events. Green belt with walking paths. ASU West very close. Airport and downtown within 30 minute drive. Near ASU West and Midwestern University. Neal and Shirley Hawkins, owners, are a retired couple who enjoy travel and family events. Neal is a former Air Force pilot and airline captain (US Air). Our Granddaughter Haley manages the property with us and has hotel and hospitality experience in her background. She has a new baby boy and is a stay at home mom for the present. Excellent location for short term or long term rental. Convenient for most activities in the Phoenix/Glendale area. Medical facilities, grocery store and fast food within walking distance. Clubhouse has good facilities with pool and workout room. Large green belt with walking trails next door . Pass code available from property manager. puzzles and board games in condo. The unit does not get any sunlight in it so you always need all the lights on. We didn’t think the condo and the area where it is located was worth the monthly rate. We had to clean some of the condo to feel comfortable. He may need a different cleaning company. There is nothing pleasant to look out at sitting on the oversized and uncomfortable sofa. Disappointed in our first try at snow birds. As others have mentioned, the neighbors overhead seem to enjoy stomping around their unit around the clock. Using the fans that the owner is thoughtful enough to supply drowns them out at night and I don't care about it during the day. If you're a light sleeper or have young kids though I'd ask the owner about it first. The condo is well equipped with everything you need from pots, pans, towels, shower supplies, etc. We appreciated everything that we needed being there. The set up is great with each bedroom at opposite sides of the living room giving kids and parents (or 2 couples) privacy. The in unit washer and dryer was great. The pool and grill area are very well maintained and we enjoyed taking advantage of using both of them. We've stayed in this condo complex before at other units and would certainly be happy to stay in this unit again. This was my third time staying at this condo. This time for my niece's graduation. The location is perfect. Close to my relatives and grocery stores and bank just a block away. The condo was clean and provided all necessary amenities for my long weekend visit. Even took advantage of the pool in the mornings. Only negative would be that the A/C is a bit loud. But overall not an issue as I typically visit during the cooler months. Would definitely book again for my next trip. I'm sorry that you did not have the positive experience we try and provide all our guests. Comfort is a high priority with us and I would like to hear from you what was lacking. Also why you felt the cleanliness was not up to standard. We have a professional cleaning crew come in before every guest and then inspect the unit ourselves to make sure nothing is missed. The situation with the noisy neighbors was regrettable. After you advised me of the problem, I immediately confronted them and received assurances that the disturbance would not happen ever again. Since you did not contact me again, I assume the noise stopped and there were no more incidents. Subsequent guests have reported no problems. I don't know what problems you had with ambulances. The condo is not on a through street and is well removed from any street noise. The hospital is roughly two blocks from the condo and has never been a factor in any disturbance. To the contrary, I have always considered the availability of medical services and an emergency room to be a positive, not a negative.